To Cite: Garavand A, Samadbeik M, Kafashi M, Abhari S. The Identification and Classification of Deployment Challenges Related to Electronic Health Records: A Review Article, Shiraz E-Med J. 2016 ; 17(2):e33304. doi: 10.17795/semj33304. Context: The implementation and operation activities related to electronic health records (EHRs) have increased in different countries, and their importance is clear. However, the deployment of an EHR system depends on many factors that must be considered during implementation. The goal of this study was to identify and classify the challenges related to EHR deployment. Evidence Acquisition: The present study involved a literature review that was carried out through a search on the ISI, PubMed, DOAJ, Scopus, Science Direct, and Google Scholar databases, as well as the Google and Yahoo search engines, using the relevant MeSH keywords and focusing on the period of 2005 - 2015. The data were collected in an Excel file and analyzed based on the study objectives. Results: From the investigation of related articles, we found that the deployment of EHRs faces many challenges that can be classified into six main categories. These are economic, behavioral, human, technical, legal, and organizational challenges. Conclusions: With regard to the obtained results, it is recommended that the authorities put effort into resolving the economic, behavioral, human, technical, legal, and organizational challenges related to the implementation and deployment of EHRs. In the dynamic environment of health, information and communication technology (ICT) has played a guiding role and noticeably affected the healthcare pattern at all levels (1). Health information technology is a combination of medical sciences with information technology is responsible for the collection, processing, storage, distribution, and sharing of audio files, images, text, and comprehensive numerical information in electronic form through use of computer hardware and software to aid in information communications and decision making (2, 3). The rapid development of technology and health informatics has encouraged organizations providing healthcare services to acquire the necessary skills to provide advanced and qualified medical services (4). The electronic health record (EHR) is one of the most widely used technologies in health system; there have been many studies on this topic in recent years. EHRs contain all information related to the health of citizens from before birth until after death; this is gathered consistently over time and stored electronically. All or part of the record is available to authorized persons without regard to place or time (5-7). The EHR represents one of the most ideal healthcare information systems (IS), but it must be carefully designed and managed according to the needs of the community (8). To deploy an EHR, its underlying and preliminary steps must be well implemented. Table 1 shows the processes involved in creating an EHR system (5, 9). Failure in each of the above levels listed above can cause challenges to the deployment of EHRs. Therefore, after the successful achievement of the first four levels shown in Table 1, a decision should be made about whether to implement the EHR system. Implementation and deployment of EHRs is the ultimate goal of the establishment of information technologies in health systems (9), but this always involves many barriers and challenges (10-13). Using different viewpoints, researchers have studied the barriers, acceptance, use, and continued use, as well as implementation, operation, and deployment of the EHR system, and have achieved extensive results. Littlejohns et al. (14) stated that the causes of health information technology use project failure in a hospital in South Africa were the lack of appropriate infrastructure; different expectations of the users, designers, and managers of the project; inattention to cultural features and the care environment; and an underestimation of the complexity of processes of care. After quantitative and qualitative investigations, the researchers stated that there is no special difference between the causes of failure in this project and the reasons for the failure of similar projects in other countries. In their study, Langarizade et al. (15) investigated the technical, organizational, and legal factors related to the deployment of EMRs and concluded that of five studied hospitals, three exhibited appropriate readiness; furthermore, in terms of technical requirements, the studied hospitals showed a higher level of readiness. Ajami et al. (16) stated that a hospital’s for implementation of EHRs has four main scopes, as follows: 1. organizational culture, 2. management and leadership, 3. operational readiness, and 4. technical Readiness. Moreover, Hostgaard and Nohr (17) concluded that the greatest problem in the implementation of EHRs is organizational culture. Many studies have emphasized training of providers of care services to promote their individual readiness (18, 19). Mirani et al. (8) investigated the barriers to implementation of EHRs in Iran, considering the technical, organizational, personal, financial, ethical, and legal factors. They found that the most important barrier to the implementation of EHRs is the technical barrier. In their study, Jelvay et al. (20) stated that the most important barriers to the implementation of EHRs are financial and budgetary barriers, operational barriers, persons’ attitudinal and behavioral barriers, organizational change barriers, technical barriers, legal and ethical barriers, and standardization barriers. Nematollahi et al. (21) determined that persons’ attitudes and behavior are important in the implementation of EHRs. Concerning the importance and development of health systems and the need for such systems for the appropriate management and use of healthcare information and to improve the quality of healthcare delivery, the identification and classification of the EHR implementation challenges and reporting such challenges to the authorities can lead to organizations effective understanding of their strong and weak points related to the implementation of the system. It can also help to estimate their readiness more exactly and perform the appropriate planning to eliminate these challenges. If challenges are not considered in the implementation, and this leads to IS failure, this will waste time and money in the healthcare system. Moreover, the system will neither be able to develop in a competitive environment nor deliver healthcare services efficiently. Given the importance of EHRs in providing healthcare services, in this study, all challenges concerning the method of EHR deployment in previous studies were identified and classified into groups according to their general dimensions; then, the independent variables of each group were determined. In doing this, the goal of the study was to identify and classify the barriers to EHR deployment. This study is a narrative review study that was carried out with the goal of identifying and classifying the EHR deployment challenges identified in original research articles published up to 2015. To perform a comprehensive search, the ISI, PubMed, DOAJ, Scopus, Science Direct, and Google Scholar databases, as well as Google and Yahoo search engines, were investigated using synthetic keywords. 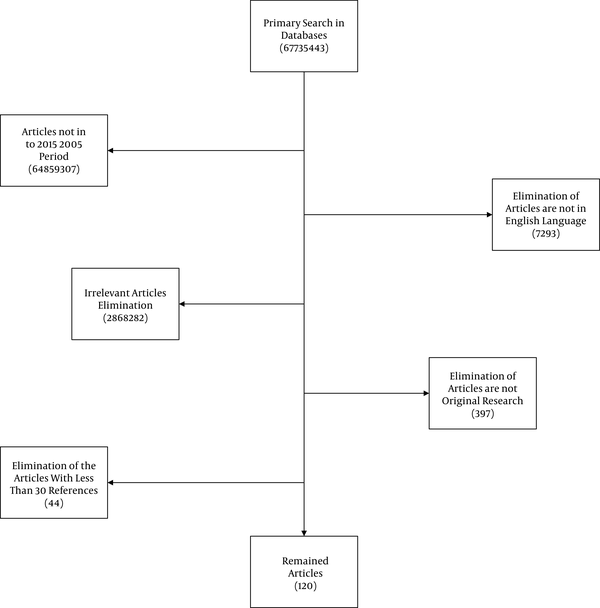 Figure 1 shows the article search strategy. First, articles published in 2005 - 2015 were searched in the above databases, and then all retrieved articles in the English language were investigated; articles published in other languages were excluded from study. In the next step, all irrelevant articles were eliminated. After this, review articles, letters to the editor, short articles, and case reports were excluded. Thus, only original articles remained in the study. Finally, articles with less than 30 references were excluded. As a result, 120 articles met the inclusion criteria and were investigated. After performing a comprehensive search of the above databases and considering all inclusion and exclusion criteria, 120 articles remained in the study. The required information from these publications was entered into a self-designed checklist consisting of items like the article’s subject, the independent variable and its definition, and dependent variables related to each independent variable; then, the information was summarized and reported using the Excel 2007 software based on the research objectives. We coded independent and dependent variables in our study and entered them into an Excel file to enable easy, rapid deletion of variables that overlapped with the key variables. After performing investigations in six databases and two search engines (Table 2), 67,735,443 articles were found. Ultimately, 561 relevant abstracts were selected and investigated based on the research objectives. To select articles that were relevant to the study goal, important keywords that relate to all steps of EHR implementation were used, as shown in Table 3. Finally, after investigating of 561 available abstracts, the required information was extracted from 120 relevant articles; these are listed in Table 4. As shown in this table, the main variables comprising latent variables were classified into in the six main groups of economic, behavioral, human, technical, legal and organizational factors, while variables related to each latent variable were classified as observed variables. A latent variable is a variable that cannot be measured directly; rather, it is measured implicitly through the covariance of two or more observed variables in the identifier role without random error; the observed variable is the variable set in the identifier role (22). The result of investigations of the performed studies showed that successful implementation of health information technology, particularly EHR systems, will be extremely effective in improving the delivery of healthcare services, reducing costs in the long term, saving time for physicians and patients, integrating patient information, and so on (23-26). Nevertheless, for successful implementation of this important technology, requirements, triggers, and deployment barriers must always be investigated, and necessary actions must be carried out to resolve any issues. The results of the comprehensive investigation of the previous studies showed that there are many requirements in deploying EHR systems, each which requires a separate, comprehensive investigations. After reviewing the studies, the EHR deployment challenges were classified into six main groups, namely economic, behavioral, human, technical, legal, and organizational factors. Each type of challenge is affected by many variables, as described below. This factor includes items like the cost of purchase or design, cost effectiveness, efficiency, and budgeting. In addition, the cost-effectiveness and efficiency of the system comprise variables that can be calculated (27). Several studies have identified financial factors as one of the barriers to EHR implementation (28, 29). For instance, Asadi and Mastaneh (12) considered economic factors as a driving factor in the use of health information technology. Moreover, Schleyer (29) stated that failure to obtain return on investment has resulted in the criticism of ICT. In contrast, Rippen and Yasnoff (28) estimated the value of the efficient use of ICT in healthcare industry at more than $87 billion. In addition, Jelvay et al. (20) stated that the most important barriers to the implementation of EHRs in Iran are financial and budgetary. In relation to the lack of circumstances for the implementation of EHRs, it seems that one of the factors must be considered as a barrier, and the necessary actions to resolve them must be carried out. Therefore, authorities and policymakers should review and calculate the necessary financial resources for deployment of the EHR system, calculate the cost effectiveness and efficiency of the respective system, and carry out the necessary actions in order to deploy it. Behavioral challenges include adoption and use, satisfaction, and culturalization. In recent decades, behavioral factors have been considered in many applications related to information technology in the health system at various stages of implementation (30-32). Indeed, behavioral factors relate to individuals’ and communities’ attitudinal and cultural issues concerning information. Most physicians are reluctant to use computerized information systems and do not express any interest in doing so (33). Rippen and Yasnoff (28) stated that cultural problems and dissatisfaction (behavioral and cultural attitudes) are important in the implementation of ICT in the healthcare system. In research performed by Mitchell et al. (34) human factors and acceptance of the new technology by human resources are the critical factors in the use of information technology. Thus, behavioral factors, including adoption and use, satisfaction, and culture, have important effects on the deployment of EHRs, and authorities should note behavioral and cultural issues at both the individual and social levels. This challenge includes awareness, the congruency of individuals’ educations and job with knowledge, and other human issues, such as individual factors that affect the deployment of the EHR. In his review article, Lluch (10) investigated healthcare specialists as a barrier to the establishment and use of health information technology. Nematollahi et al. (35) stated that holding educational workshops and promoting individuals’ knowledge are effective in the implementation of EMRs. In addition, other studies have emphasized the impact of the education and training of individuals, as well as individual factors, for the implementation of the EHR system (8, 20). Hardware infrastructures, software, networking, IS, and IS support are some of the most important items that should be considered in terms of technical challenges of EHR deployment. In most performed studies, technical factors have been investigated extensively (10, 12, 20, 36-38). Bagayoko et al. (39) stated that the establishment of the appropriate hardware and software infrastructures is one of the prerequisites of the successful use of the IS. Mirani et al. (8) also noted that technical issues represent the most important barrier to the implementation of the EHR systems in Iran, and suggested that appropriate technical measures must be taken to resolve this problem. Legal factors include confidentiality and IS legal, information security, and access levels. Because of their immense importance, individuals’ medical records both in computerized and paper form always have high sensitivity (21). Therefore, attention must be paid to the legal and ethical issues in the implementation of EHR systems. Sheikhtaheri et al. (40) discussed the importance of patient safety information systems (PSIS), which require the appropriate design and implementation in Iran hospitals. This challenge includes items like development of IS, ease of use, policymakers’ support, integration of IS, IS standardization, and data interchange standards. Indeed, organizational challenges have always been discussed in terms of management issues, particularly in the case of the implementation of EHR. The adoption of medical IS does not only involve purchasing the required hardware and software; rather, it is a process of interaction between users, organizations, and the environment (33). Bagayoko et al. (39) identified two important prerequisites for the successful use of IS, namely a rigorous and consistent organization of the actors and processes of care in which they are involved. In the United States, Reid et al. (41) assessed the role of organizational factors as a disincentive for the use of ICT. Moreover, Mirani et al. stated that organizational factors represent one of the barriers to the implementation of EHR but that they are less important than other factors (8). In contrast, Garavand stated that organizational factors represent one of the key factors in EMR deployment (9). Through the preparation of standards and IS development, the codification of policies, support from authorities, and precise planning to encounter organizational challenges, this threat can be turned into an opportunity. Having outlined the six general dimensions introduced in this study and their observed independent variables, these challenges can be presented as shown in Figure 2.
q; questions that about any observed independent variables that can be identified in another studies. 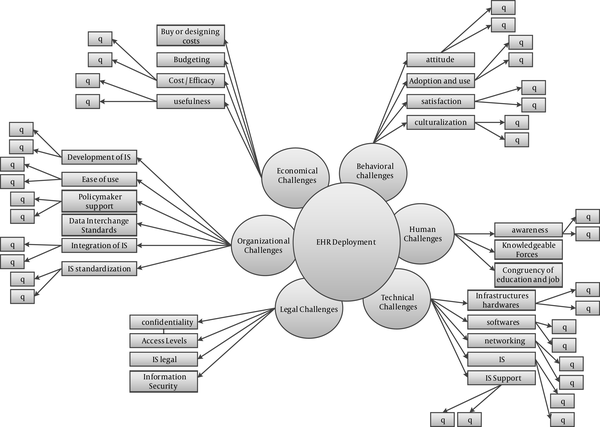 Some studies have investigated the barriers and challenges related to the implementation and deployment of the EHR from other perspectives than those described above; therefore, the attempt has been made to build a model that includes all of the involved items and all challenges that previous authors have considered. The results of all the performed investigations are shown in Figure 2. With regard to the high volume of data in the health system and the importance of their use, the adoption of computers and especially EHR systems has become necessary to advance organizational goals. Different challenges and barriers have been identified for EHR implementation by many studies investigating EHR deployment and implementation. With regard to the importance of the investigation of barriers and challenges, it is suggested that researchers perform comprehensive studies in this field to determine the opportunities and risks related to EHR systems. The results showed that the most important challenges for EHR are economic, behavioral, human, technical, legal, and organizational issues. Therefore, it is suggested that authorities and administrators of EHR implementation in the Ministry of Health should consider the appropriate budget for the design, purchase, and establishment of this system. This will result in higher efficiency and cost effectiveness in the implementation. In addition, various training courses and scientific education in the field of EHR must be provided to address the attitudinal, cultural, and human factors that may create a challenge for the implementation of EHRs. Furthermore, the Ministry of Health must generate specific standards to resolve issues relating to legislation, support systems, available hardware and software, and the other organizational issues, such as the integration of existing systems.